Bay Watch Villa is a lovely seaside cottage situated on the white sands of Runaway Beach. The new five-bedroom villa in Jamaica has a contemporary, tropical decor and is prime waterfront property. It offers the comforts of home, very tropical colors and a fresh contemporary style. 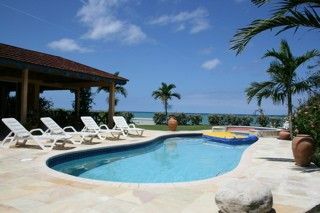 The villa rental in Jamaica is located only 5 minutes’ walk to the famous Breezes SuperClubs. The large L-shaped verandah at Bay Watch Villa takes advantage of the water views and offers a fabulous place for relaxing in the hammock or just sitting on the verandah and enjoying drinks. Tables and lounge chairs are also available, making this area perfect for lunches or casual dinners, or for simply sitting and enjoying tropical drinks and watching the mesmerizing views. The main house at Bay Watch Villa has 3 bedrooms, all offering air-conditioning, ceiling fans and en suite bathrooms. A two bedroom newly built annex is directly across the paved terrace. The annex has two bedrooms, two bathrooms and a loft, perfect for young ones. The annex can accommodate up to 6 additional guests. These bedrooms also have ceiling fans and are air conditioned. Being a very family friendly villa, a crib and high chair are available if required. The bedrooms are all spacious and simply furnished, with minimalistic traditional furniture and vibrant fabrics. The living room at Bay Watch Villa has a casual and trendy ambiance. The very comfortable furniture, art on the walls, indoor plants and amenities, including color television, DVD player, DVD library, DC/tape player and telephone make this one of the most popular rooms in the luxury villa Jamaica. The dining area is adjacent to the seating area, offering a lovely dining table that seats six. Exquisite ocean views are available from the several windows and door. The stunning Bay Watch Villa features an extra-large and very spacious swimming pool tiled with lovely turquoise and blue tiles, and an adjoining smaller pool for children. The sunning deck offers very comfortable lounges wonderful for reading, relaxing, or snoozing. The pool deck at this Jamaica villa offers fabulous ocean views. The lush green grassy lawn surrounding the pool creates the loveliest picture! There is a full staff of housekeeper/cook and beach person. The staff is very hospitable, experienced and professional, ensuring that the guests’ every need is fulfilled.